9/15/2013 / By Dylan / In: Rough Drafts / Comments Off on The future of education: Tablets, or hands-on? Two Bit Circus founder Brent Bushnell with an interactive game. On the one hand, as I wrote in a piece today on VentureBeat, this is exactly the vision — shared by One Laptop per Child — first outlined in Neal Stephenson’s “The Diamond Age.” A self-guided curriculum, embedded in a digital book, that could teach children everything they need to know via engaging songs, games, and interactive projects. Screenshot from an Amplify video. On the other hand, like the Times writer, I have an urge to yell at the tablet-focused kids in the book: Go outside! Climb a tree! And in fact I probably do yell that at my own children, from time to time, when they are on the verge of disappearing into a screen-centric vortex of digital media. But then it occurred to me that an interactive tablet is perhaps not the best way to use technology to engage children. It’s certainly not the only way. Earlier this year, I visited the studios of Two Bit Circus, an exciting experiment in “STEAM” education (Science, Technology, Engineering, Arts, and Mathematics — the A is an addition that makes the acronym much more interesting, and inclusive, than the usual STEM). I wrote about Two Bit Circus and their STEAM Carnival project when it was just getting started on Kickstarter. The project achieved its funding goals, and the team has been busy putting together their act since then. 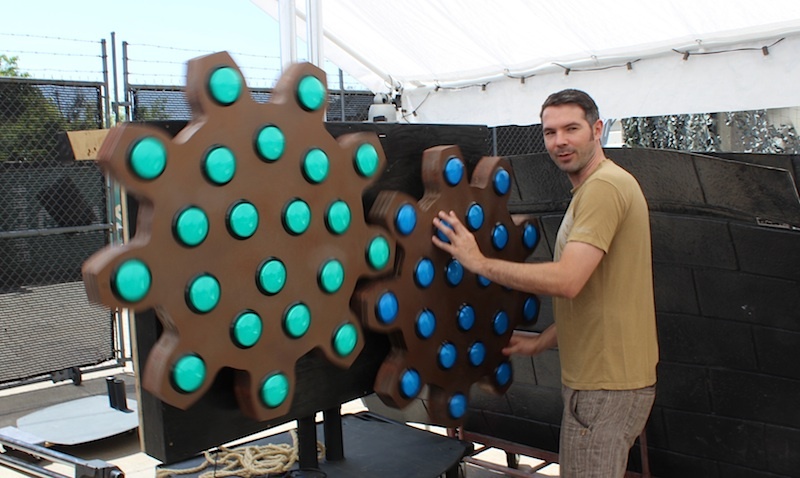 The project, in a nutshell, is to create a traveling “carnival” that would amaze children with steampunk- and Maker Faire-like circus attractions. Instead of slamming a hammer down to make a pellet ring a bell, the hammer would make an electrical arc rise up on a Jacob’s Ladder. Instead of a 3-ring circus with lions and clowns, the circus would offer the chance for kids to pit robots they’ve made against one another. The Steam Carnival approach to educational technology is to make kids understand that tech is something they can build, not just something they use. I like that approach, and I think it’s increasingly important. In other words, don’t just go outside and climb a tree. After you come down from that tree, figure out how to make a robot, a computer program, a musical score, or a digital video that you can show others. Put it together, wire it up, program it, direct it, edit it. The tablet should be a tool for engaging creativity, not just a game that helps kids learn rote lessons mapped out by their state board of education. There’s room for both, I think. But the vision is not fully realized unless children are hacking into their tablets and writing their own software for it. Or using their tablets to control battlebots.